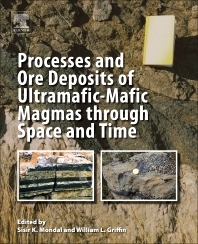 Processes and Ore Deposits of Ultramafic-Mafic Magmas through Space and Time focuses on the fundamental processes that control the formation of ore deposits from ultramafic-mafic magmas, covering chromite, platinum-group element (PGE), Ni-sulfides and Ti-V-bearing magnetite. The exploration, exploitation and use of these magmatic ores are important aspects of geology and directly linked to the global economy. Magmatic ores form from ultramafic-mafic magmas and crystallize at high-temperature after emplacement into crustal magma chambers, and are genetically linked to the evolution of the parental magmas through space and time. This book features recent developments in the field of magmatic ore deposits, and is an essential resource for both industry professionals and those in academia. Sisir K. Mondal is a Professor of geology in the Department of Geological Sciences at Jadavpur University in Kolkata, India, and a Research Associate at the American Museum of Natural History in New York City. He is a hard-rock geologist whose primary field of specialization is in ore geology, petrology and geochemistry of ultramafic-mafic rocks. He received his PhD from Jadavpur University. William L. Griffin is an Honorary Professor of geology at Macquarie University in Sydney, Australia. Dr. Griffin’s research interests include the petrology and geochemistry of the deep crust and lithospheric mantle, the geochemical and dynamic evolution of the crust-mantle system, and magma generation and metasomatism in the crust and mantle. He received his PhD from the University of Minnesota. Adjunct Professor of Geology, Macquarie University, Sydney, Australia.